Karen Miller and Susan Ritchie, of online yarn store Mrs Moon, bring you stitch-by-stitch proof that it can be super-simple to create modern-casual knitted clothes, accessories, and homeware. There are quick-to-knit pieces that you can make in a day, through to more ambitious projects that will take longer, and will introduce novice knitters to techniques such as cables, colorwork, and chunky lace. From an easy-knit Sloppy Joe sweater that will become a favorite wardrobe staple to a brioche-stitch scarf that uses a beautifully simple stitch pattern, from a zigzag-stripe throw in delicious colors to a textured bolster, from a delightfully droopy bunny to a cute baby beanie, there are projects here for you, your home, and your family, whatever your level of knitting knowledge. 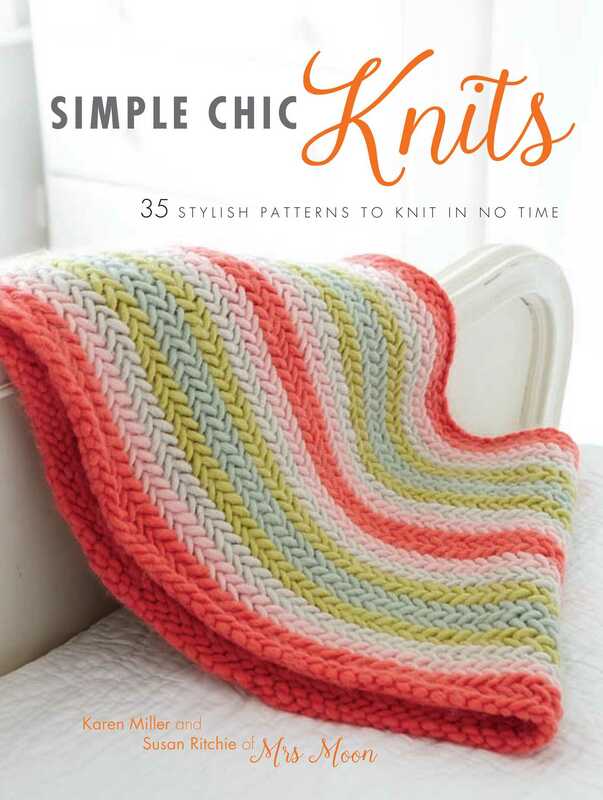 Karen and Susan’s successful business and constant interaction with knitters of all levels of skill and all kinds of tastes, have given them a wonderful insight in to the types of projects knitters crave, and Simple Chic Knits is filled with items that will have fingers itching to knit.